Seahorses in pairs or groups can be an exciting addition to a saltwater aquarium. The Tigertail Seahorse species is fairly common in the aquarium trade. Even better, Tigertails are easy to breed and will do well and reproduce regularly if offered a proper diet on a regular basis as well as safety from even perceived predation. Origin Indo-Pacific tropical waters around Malaysia and Singapore and as far east as the Philippines. The Tigertail Seahorse comes from the Western Central Pacific. It is found off the shores of Malaysia, Thailand, Singapore, Vietnam, and the Philippines. They generally travel in pairs, often in sponge gardens and floating seaweed gardens such kelp and sargassum. Their habitat, subtidal aquatic beds and coral reefs, is threatened by climate change. 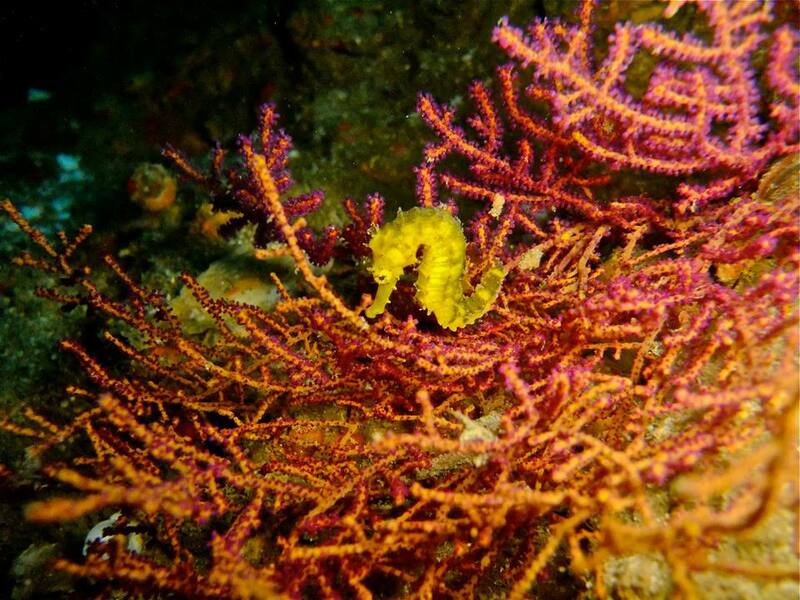 Seahorses are also collected in large quantities for use in Chinese herbal medicine. Tigertail Seahorses are long black and yellow fish with long snouts, prehensile tails, and 16–19 pectoral fins. Their coloring may vary by gender, with males being blacker and females being yellower. They wear a bony "coronet" of five rounded spines and have spines on their cheeks and noses. They have alternating tiger-striped rings from their bellies to the tips of their tails. Instead of scales, they have thick skin over boney rings. Their coloring and their physiology both help protect them from predators. As with most Seahorses, the Tigertail Seahorse does best in a quiet tank with little competition for food. Less aggressive fish such as Pipefish and Mandarinfish make good tankmates. Avoid aggressive species such as blennies, gobies, wrasses, triggerfish, and porcupinefish. Seahorses are monogamous; the Tigertail Seahorse does best in pairs or small groups in an aquarium. Seahorses require stationary perches to wrap their prehensile tails around. Perches can be artificial or real; gorgonians and plastic plants are both good options. Since Seahorses are not strong swimmers, they do best in a tank with a low water flow. Seahorses greatly prefer a tall tank in captivity. The DIY Seahorse Tank works very well for Seahorses. Transiting the entire tank during the day, they can be found on the surface of the water as well as examining the substrate for potential food. The Tigertail Seahorse is a consummate carnivore in the wild, where they feed upon amphipods and other small crustaceans found in live rock. Seahorses should be fed live or (if they will take it) vitamin enriched frozen or freeze-dried mysid shrimp. Seahorses should be fed several times per day with food available for 20 to 30 minutes per feeding. Wild caught Seahorses may be slow to accept frozen or freeze-dried mysid shrimp as food to begin with and may have to be fed live foods until they are weaned onto prepared foods. Tank-raised Seahorses (greatly preferred to wild-caught) are normally trained to accept frozen or freeze-dried mysid shrimp at an early age and will make the transition to your tank much more easily than wild caught. The Tigertail Seahorse is not an aggressive feeder. This fish will closely examine every piece of potential food before consuming it. If tanked with more aggressive feeders, the Tigertail (in fact, almost every Seahorse) will starve to death over time. Males are often blackish, while females are usually yellowish. The male carries the eggs in a brood pouch located under the tail. The mating ritual of the Tigertail Seahorse is quite fascinating. When the male is ready to mate, he will present the female with a dance, color changes, blatant pouch displays, and active gyrations. If the female is receptive, she will entwine tails with the male, dance, and promenade with it, and then insert as many as 500 to 600 eggs in the male pouch. About two weeks later, the male gives birth to between 50 and 400 miniature duplicates of the pair. Once "born," the miniature Tigertail Seahorses no longer depend on their parents for food or survival. In the wild, the baby Tigertail Seahorses migrate to the surface of the ocean and merge into the plankton "soup" for both food and concealment. While in the plankton, the seahorses feed upon whatever moves and will fit in its mouth. In the wild, the Tigertail Seahorse will not feed upon anything other than live food–hence the challenge of weaning the small seahorses off onto hand fed frozen and freeze-dried foods in captivity. Ectoparasites (external parasites) including Cryptocaryon irritans, Amyloodinium (Oodinium) ocellatum, Brooklynella hostilis, parasitic crustaceans, gill flukes, Glugea, etc. Endoparasites (internal parasites) including protozoans, flatworms, flukes, roundworms, tapeworms, etc. Exophthalmia (" pop eye") is not exactly a disease, but rather a symptom that is brought about by disease. Flesh-erosion disease, in which the "skin" of the Seahorse literally peels away. Internal gas bubble disease is similar to external gas bubble disease, but the bubbles remain inside the Seahorse's body. Pouch emphysema is the trapping or creation of air bubbles within the male Seahorse's brood pouch. Snout rot is caused by either by a fungal infection (in which case the snout will be pinkish) or bacterial infection (in which case the snout will be white). Most Seahorse diseases are either caused or exacerbated by poor water quality in the aquarium. Otherwise, check out all of our other pet saltwater fish breed profiles.